"Our five-day ordeal in Jakarta is mercifully over. At times, especially in the middle of the night, when the mosquitoes, the heat and the noise made it impossible to sleep, and our minds reviewed the horrible scenes from the day before, we were certain we would be stuck in this hell hole forever. And to think that we had spent Christmas here!" 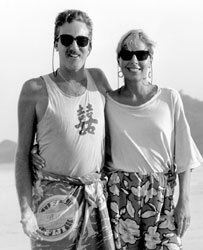 In June 1986, Chris Edwards and Elaine Weeks, the publishers of The Walkerville Times, embarked on a one year, backpacking around-the -world, honeymoon. During their journey, they visited 15 countries; here is how they spent Christmas in 1986, haflway around the world from Walkerville. Six months into our unforgettable round-the-world backpacking honeymoon, Chris and I found ourselves on another gruelling train trip. Getting from A to B on a tight budget can be so debilitating- in the tropics it is usually survival of the fittest. The ten-hour journey from Jogjakarta to Jakarta on the over-populated island of Java was bearable only because we had reserved seats in second class. We were not looking forward to Jakarta, our next destination. It had a reputation on the coconut telegraph (the budget traveller's gossip and destination rumour mill) as the hell hole of Asia (a distinction it shared with Dhaka, Bangladesh). 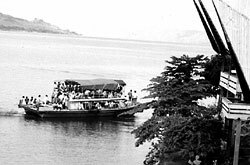 But we had no choice - in order to catch a boat to our next destination- Lake Toba on Sumatra, renowned as a fantastic place for weary travellers to rest their bones (but that adventure will not form part of this tale) we had to go to Jakarta first. Our decrepit train was packed; school kids were returning home from the Holidays, and combined with the usual hoards of people going somewhere in Indonesia- on this island called Java, which is only twice the size of Vancouver Island, there were well over 100 million souls! - many passengers stood or sat in the narrow aisles the entire way. Adding to everyone's misery was the tropical heat; it was like somebody had dropped a gigantic wet tarp over our heads. Ancient fans whirring lazily over our heads did little but shift the stifling air about. The two of us were unable to stretch out our legs so there we were, trapped in our hot and sticky seats like giant ants in maple syrup. Well, at least we had seats. Another annoyance, that grew more irksome as time went by was the fact that we had decided to restrict our liquids while on board; we did not want to use the toilets (no doubt perfectly disgusting). Trying to get past all the people wedged in the aisle would have been a feat in itself. Besides stopping at the dozens of stations along the way, the train periodically stopped for no apparent reason. Everybody just seemed to grin and bear it, even though the fans were turned off during these increasingly irritating intervals. Chris and I would morosely stare out the window at yet another rice paddy shimmering under the sun's relentless glare. "Why are we doing this again?" we'd ask each other. Near sunset, we finally entered the outskirts of Jakarta. The two of us congratulated ourselves on surviving yet another travel ordeal and we reminded each other that the good places were usually the hardest to get to. Soon we would be sitting in a beautiful lake house house enjoying a banana cognac. Our revery was broken when suddenly the train stopped dead in it tracks with no station in sight. For no apparent reason. And stayed that way for half an hour. With the fans turned off. Everyone's eyes seemed to glaze over as if to trick themselves into believing this wasn't really happening. The waiting was like Chinese water torture. And then finally, the train began rolling slowly forward. 15 long minutes later, we inched into the station. We stumbled off the train, exhausted, dehydrated and nearly delirious. Our Lonely Planet guidebook promised we would find cheap rooms and food just across the street in Jolan Jaksa, the budget travellers' accommodation ghetto of Jakarta. Of course we had to trudge for a half hour before finding a vacancy. For 5000 RP ($5), we were given a small room with a fan, a double bed and a table. It wasn't the Ritz but the pickings were slim as all the hotels seemed filled with travellers. What were they all doing in Jakarta at Christmas? Much of the budget travellers' life is occupied spending downtime in one location while trying to get to another more desirable one. We were at the mercy of the boat schedule; all we had to do was somehow survive the heat, the noise, the crowds and the filth (did I mention heat?) before we were released from our purgatory on the day after Christmas. We passed part of the time catching up on our card and letter writing. Coming from big families, we'd written over 100 cards and twenty letters at this point in our journey. Sometimes, it would be weeks before we could post any so we were sure that our loved ones back home got pretty worried. There wasn't any mail waiting for us here - the next news we would receive from home would be in Singapore about four weeks later. One morning, we woke early to do the local sights before it got too hot. Jakarta was once known as Batavia, capital of the eastern Dutch Empire. The Dutch arrived in 1596 when Cornelis de Houtman landed at the harbour of Jakarta. Their trade blossomed and their foothold in 'Jayakarta' grew stronger after the founding of the VOC (Dutch East Indies Company). Several years later, in 1619, Jayakarta was razed to the ground by the Dutch under Jan Pieterszoon Coen. On its ashes, the Dutch founded a new settlement, Batavia. The settlement became the Dutch center of power for 350 years in this part of the world, until it fell into the hands of the Japanese imperial forces in 1941. 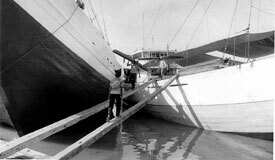 At the ancient port of Sunda Kelapa- awash with magnificent Makassar schooners- deckhands unload huge planks of hardwood by walking up and down 8” wide planks. Today, the old Dutch port Sunda Kelapa remains a marvel. Hundreds of giant wooden ships - Makassar schooners or, pininsi, line the wharf like a scene out of a pirate movie. We didn't see any under sail but we did witness the vessels being loaded and unloaded by hand. It was incredible to see the deck hands carry huge planks of hardwood, sacks of rice and other foodstuffs up and down 8" wide ramps from the boats to the dock. The canal near the port made our stomachs turn. All manner of human and animal waste, garbage and general debris coated the surface. Two rows of dilapidated shanties lined the water's edge along a smaller canal. There was probably no hope in hell for anyone living here to ever improve their lot in life. This was where they would be born, live and die. While walking along another fetid looking canal a day later, we spotted three men up to their chins in the blackish brown, wretched looking water. We eventually realized that they were not mad, they were fishing! For what, we never discovered. Better not to know. As usual, we encountered many beggars in the streets. At least we didn't see as many people sleeping outside as we had seen in Jogjakarta. They shared the streets with the rats and giant cockroaches that seemed ubiquitous in South East Asia. To make our $10,000 budget last the entire year, we generally ate what the locals ate. "Western" food was pricier and we actually preferred the various noodle and rice dishes that were local fare. Besides being easier on the pocket book, they were usually delicious. It had been a while since we had tasted a cheeseburger and sometimes, nothing else will do (not even turkey!) so for Christmas dinner, we decided to splurge. We located a restaurant that not only prepared amazing hamburgers but served up pretty mean chocolate shakes too. It may not have been a turkey dinner with all the trimmings, but we felt almost festive as we ate our food with relish (and ketchup and mustard!) especially since we knew that the next day, yes! - we would finally be leaving! Walking back to the hotel with a friendly Aussie couple, we kept a wary eye on the giant rats that seemed to trail us up the road. We joked about how it was a real 'rat race' here! The Boat Ride - There is a God! We had not been alone in our long wait for deliverance. Fellow travellers shared our frustration and one in particular, Bob, an engaging lawyer from California, told us he was scheduled to leave on the same boat. But Bob had decided to celebrate Christmas by sharing his bottle of Scotch with another traveller who had produced a bottle of cheap Indonesian hooch. Needless to say, when we rapped on Bob's door the next morning, we discovered him in no shape to go anywhere. Bob decided to remedy this by polishing off the Scotch. Witnessing his hangover treatment, we thought we'd be smart to head off by ourselves. We were so sick of waiting, we couldn't bear the thought of being delayed by him and possibly missing our ticket out of here. We got to the port easily by bus, although finding the right boat proved to be tricky. When we finally spotted our boat, we were drenched by a tropical downpour as we ran up the gangplank. But we didn't care - we were finally on that damn boat! We had made it aboard and into our relatively luxurious accommodations (at this point, anything looked good!) half an hour before sailing. At ten minutes past the 1 pm departure time, the door to our cabin burst open and Bob staggered in with a gash on his forehead, muddy knees and a big drunken grin on his face. A couple of deckhands had taken charge when he'd fallen flat on his face after climbing out of the taxi at the port and they gently deposited him in the room. Exactly two minutes later, we felt the boat move. After celebrating with a big hug, Chris and I decided to go explore so that Bob, who was snoring in one of the beds, could sleep it off for a while. As our boat passed the island of Krakatoa between Java and Sumatra, site of the massive volcano eruption in 1883 that was felt around the world, I had an overpowering sensation that I was dreaming. Was I really here or would I wake up in that dingy hotel room in Jakarta for yet another day in hell? Perish the thought!